Five-hundred Americans will fork over a total of $19,500,000 for the pleasure of owning Mercedes-Benz 450SEL 6.9s in the next twelve months and, presumably, each year thereafter, until Mr. Carter or his successor puts a stop to all such automotive hedonism. Except for the vagaries of international monetary fluctuations, the 6.9 might have made it to this country for $23,000 or so, but inflation, the strength of the Deutsche mark and the relative weakness of the dollar and everything else have combined to dictate that your own personal 6.9 sedan will cost you $38,230 f.o.b. New York. For your money, you'll get, perhaps, the ultimate manifestation of the basic Daimler-Benz idea of how automobiles are supposed to be designed and built -- the best Mercedes-Benz automobile ever sold. That does not necessarily make it the best car in the world; not even the most luxurious. We have to call anything that has wheels and seats and a price of $40,000 a luxury car, but this Mercedes doesn't offer a great deal of luxury for that kind of money. 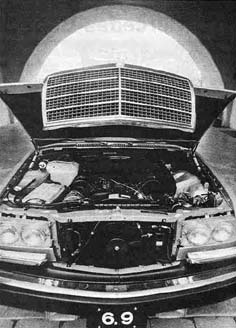 It is virtually indistinguishable from any other 450SEL, except for the 6.9 emblem and the wider wheels and tires, and there are no important interior clues, other than a strip of wood across the fascia, to set it apart from any other Mercedes-Benz. If I spent almost 40 grand for an automobile, I'm not sure I'd want it to look just like my neighbor's 280S. Be that as it may, however, and perhaps it never was, there was no speculation whatsoever involved in Daimler-Benz's decision to market the 6.9 in America. The car is here because there was sufficient outcry from American dealers and customers to practically force the factory to import it, even though it can't build enough for the European market where the car has been on sale for eighteen months. At a rate of 500 cars per annum, they'll be sold as fast as they can get them off the boat and remove the cosmoline. Who'll buy it? Two kinds of people: first, those poor, bored, big spenders who'd already bought one of each Mercedes-Benz currently available and who were beginning to suffer the pangs of withdrawal because there were no still more expensive ones left to purchase; and second, that tiny handful of people, many of them former owners of Mercedes-Benz 6.3 sedans, who truly want the fastest production four-door sedan in the world and are willing to pay for it. Both groups will get their money's worth. Anybody else who accidentally stumbles into his friendly neighborhood Mercedes-Benz dealer's showroom with $40,000 burning a hole in his pocket is apt to be disappointed. This is no Rolls-Royce. There is no evidence of handcrafted attention to your every whim. It has wood and leather, but somehow these materials have been so impregnated, protected and depersonalized as to seem no different from the plastic materials they replace. The inside of a Rolls-Royce, for the same money, fairly reeks of wood, leather and loving care. The 6.9 seems to want to rub your nose in the fiction that it's just another off-the-shelf Mercedes-Benz that only happens to go through corners like it was pursued by demons and cruise quietly all day long at 130 -- the most uncompromisingly spartan luxury car we've ever driven, a $40,000 technical exercise. The 6.9 was destined to be more than a mere replacement for the 300SEL 6.3. (The 6.3 was the big news in 1968 when it was introduced. 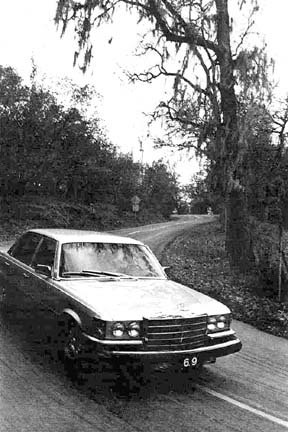 It was the 300SEL body with air suspension and a hot-rodded version of the 600 limousine's engine, and it went like the clappers. A total of 1840 were sold before Daimler-Benz stopped producing the car in 1971, but the 6.3's impact on enthusiasts far exceeded its sales.) The 6.9 is meant to be the flagship of the entire Mercedes-Benz fleet. Beneath the surface there are all kinds of fascinating bits of technica curiosa. A dry-sump engine, for instance. Self-leveling hydropneumatic strut suspension, á la Citroén, for another. Specially modified three-speed automatic transmission, beefed up driveline and a very sophisticated Watts linkage applied to the already superior Mercedes independent rear suspension to enhance anti-dive and anti-squat performance on hard braking and acceleration. How does it all work? Superbly. The 6.9 feels more nimble, more agile than any other Mercedes we can remember. The new suspension, combined with the extra power of the 417-cubic inch engine makes it possible to toss the big sedan around like a bug-eye Sprite. It accelerates 0-60 in a little over seven seconds and has a top speed of nearly 140 mph. It is rock-solid and practically silent on the road, at any speed, and the engine's mid-range performance makes serious high-speed mountain driving a positive joy. Its predecessor, the 6.3, was a little crude, a little brutal in the way it went fast. The 6.9 is not quite so fast as the 6.3, but far silkier and more sophisticated. Additionally, it enjoys all the benefits of the 450SEL body-tightness, security, stiffness and aerodynamics that not only make the shape slippery but keep the windows clean as well. 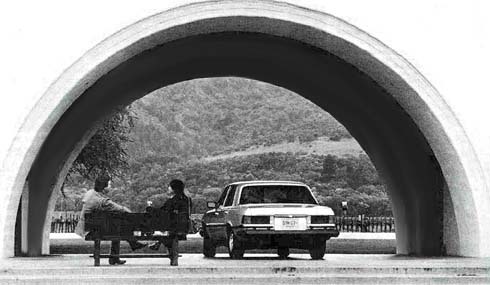 Unfortunately, both the 6.3 and its sister flagship, the 600 limousine, were quirky, troublesome cars to live with. At this point, dozens of happy 6.3 and 600 owners will take pens in hand to refute what I've just said, but I let the statement stand; they were difficult and expensive cars to maintain, whatever their other virtues, and one hopes that the 6.9 will behave better in this respect. Our initial experience was not reassuring on this point. On our cross-country voyage of discovery, we had to visit the dealer in Nashville - "Madison Smith, Naturally" - to make the air conditioning work, and the dealer in Williamsport, Pennsylvania - Fran Wylie Motors, Inc. - had to visit us in a Sunoco station on Interstate 80 when the lower pulley on the engine started to fall off, a mishap that would have cost us the services of both the auxiliary transmission pump and the air-conditioning compressor pump, as well as quite possibly fiending the radiator and other important items, had it completely unscrewed itself. Like the 6.3 and 600, the 6.9 is a fearsomely complicated car. In fact, Spencer King, chief engineer of British Leyland, speaking recently of mechanical complexity, said, "if there is a way to make something more complicated, the engineers at Daimler-Benz will find it." But the behavior of this new Mercedes over the road -- any road -- is so spectacular that one tends to overlook the means by which the engineers accomplished their ends, even the potential problems caused by such complexity, and simply celebrate the fact that such a wonderful machine exists at all. I drove the car first at Sears Point International Raceway in Northern California, all around the Napa Valley, then from San Francisco to Los Angeles to New York -- a total of more than 4000 miles -- and it was a technical and dynamic delight, even if we did suffer a little mechanical trouble. "There are no springs or shock absorbers per se in the 6.9 suspension. Both functions have been combined into a single hydraulic strut that mounts in place of the coil spring and shock absorber at each wheel. The telescoping struts support the car with oil pressure generated by a small radial piston pump on the engine. A separate bell-shaped pressure reservoir, connected to each strut by a high-pressure hose, contains a permanently sealed charge of nitrogen gas that functions as a spring. Working pressures in the system range from 2100 to 2900 psi." "When the 6.9 hits a bump in the road, the wheel rises and telescopes its suspension strut. Oil forced out of the strut passes through the hose to the reservoir, where it acts on a diaphragm and compresses the gas. The gas behaves like a progressive spring. The more it's compressed, the harder it is to compress further. In other words, the suspension rates change in direct proportion to the load. Thus the rates can be relatively soft without fear that the suspension will bottom out easily. The same softness, combined with the fully independent suspension, allows each tire to stay on the road surface even over very rough sections. To compensate for the higher degree of roll that would otherwise be encountered during cornering with the lower spring rates, the front and rear stabilizer bars of the 6.9 are stiffer than on the 450SEL." "Because the gas charge is fixed, the amount of oil in the system determines the ride height. Automatic regulator valves adjust oil volume constantly to compensate for vehicle load. Thus leveling takes place independently and automatically at both front and rear. Due to inclusion of a separate pressure reservoir for the system as a whole, this occurs even when the engine isn't running." "Front and rear level-control valves use the center of the respective stabilizer bar as a reference point. A lever connected to each bar responds to the average position of the body of the vehicle relative to the axle. When a level-control valve is actuated, additional hydraulic oil is then forced into both struts on the appropriate axle." "The front suspension and steering geometry of the 6.9 are basically the same as on the Mercedes 450SEL, but several components have been changed to accommodate the mounting of the hydraulic struts rather than conventional springs. The steering linkage has been strengthened to account for the increased vehicle weight and larger tires of the 6.9. The anti-dive feature of the W116 front suspension is particularly important with the hydropneumatic suspension due to the relatively soft springing." "The inherent anti-squat characteristic of the 450SEL's semi-trailing-arm independent rear suspension has been supplemented on the 6.9 by the addition of a Watts linkage. Each rear wheel bearing is housed in a vertical carrier positioned between the light-alloy semi-trailing arm at the bottom and the lever arm of the rear stabilizer bar at the top. The brake caliper mounts on a second carrier, which also pivots around the axle halfshaft, but is horizontal and linked to a rearward extension of the semi-trailing arm by a steel plate. The position of the trailing arm relative to the stabilizer bar suppresses the tendency of the rear of the car to squat on acceleration. Similarly, these two elements, plus the pivoting brake caliper, reduce rear-end lift on hard braking." "The hydropneumatic suspension has two operational modes, which are driver-controlled. A push-pull knob on the dash permits the selection of 'N' (normal) or 'S' (static or locked) positions. In 'N' the car can be driven or parked with normal suspension springing and automatic level control. In 'S' the front and rear axles are isolated from the main pressure reservoir. If the car is jacked up or put on a lift, the droop of a wheel will not prompt a reaction from the automatic leveling controls. The 'S' position is used during transport as well as during servicing or changing a tire. An instrument-panel warning light below the speedometer illuminates if the pull knob is moved to the 'S' position or if the system pressure is too low." "High torque for smooth, responsive driving was the prime goal in enlarging the M100 engine from 386 cubic inches (as used in the 300SEL 6.3) to 417 for the 6.9. The additional displacement comes from enlarging the bore by 0.157 inch (4mm) to 4.21 inches (107 mm). The stroke remains 3.74 inches (95mm). The high torque allows a more direct rear-axle ratio, leading to quieter, smoother running at cruising speeds." "While the deep, rigid engine block in the 6.9 is essentially the same as the block in the 6.3, the new engine benefits from the incorporation of modern technology. Much of the engineering work was aimed at reducing periodic service requirements and increasing durability, as well as enhancing the power and torque and, of course, reducing exhaust emissions." "The fuel-injection system is a good example. It is the Bosch low-pressure, continuous-flow type [K-Jetronic], mechanically controlled by an air-flow sensor ahead of the throttle. It is the same type of system being used in the 450Series and the 280E/SE. Compared to the direct-timed injection at high pressure that was used in the 1955 Model 300 and the later D-Jetronic electronic fuel injection, previously used on the 450s, the new K-Jetronic is simpler, more reliable and requires far less service." "The 6.9 is the only production sedan in the U.S. utilizing a dry-sump engine. The lubricating-oil reservoir is separate from the engine, located at the right front corner of the engine compartment. This gives a very shallow oil pan, despite the 12.7-quart oil capacity of the engine, thereby affording proper ground clearance. (The 6.9's high oil capacity is largely due to the flow requirements of the hydraulic-valve-clearance compensation system, which eliminates the need for manually checking and setting valve lash.)" "The large capacity not only ensures that there is an adequate oil supply for the demands of the 6.9 engine, but allows extension of the oil-change interval to 12,500 miles - or at least once a year. The lubricating oil does several auxiliary jobs as well as counteracting heat and friction. One is activating the timing-chain tensioner. To avoid a loose chain at start-up, the tensioner piston has a non-return ratchet feature. As the chain stretches with use, the tensioner repositions its base point so that only a very slight slack is present in the chain even when oil pressure is absent. The timing chain is a duplex roller type, driven by the sprockets on the front of the crankshaft." "The engine block extends down well beyond the center line of the five-mainbearing crankshaft, and the center three main bearing caps are cross-bolted in racing-engine style. Thrust is taken by the center main." "Attention has been given to ensuring long valve life. The intake valve stems are nitrided and the exhaust valves are filled with sodium, to conduct heat away from their heads, and have chrome-platted stems. All valves are fitted with rotocaps, and, as on all Mercedes-Benz engines, the valve seats are hardened. The cylinder heads are aluminum." After von Manteuffel's presentation, we went to Sears Point. Four of the new cars were there, and we took turns horsing them around the race track. I must have driven twenty or 30 laps in one car or another, four or five more with Phil Hill driving and about a dozen with Leon Mandel at the wheel. Hill drove like a rally driver, screaming into every corner like he'd never seen it before and scrambling for the exit like a startled cat on a freshly waxed floor. It was great fun, but the leather seats were so hard and slippery that I had trouble staying put, even with the harness buckled. Mandel demonstrated the high quality of his own self-discipline/knowledge by driving briskly but not foolishly and never doing anything silly. I drove as quickly as I dared, always with a vision of the $38,230 price tag superimposed on the road ahead. A race track is no place to drive a car like this one. The 6.9 will go swiftly and smoothly over any public road, probably more swiftly than most people will ever wish to go, but it's out of its element on a track, an artificial environment at best for a thoroughbred road machine. One of our fellow journalists managed to prove the point by going straight where the road didn't and damaging his fog lamps and air dam. Far more rewarding was the 4000 miles done on the road. I spent a day driving through Napa Valley with photographer Paul Ryan and a couple of friends, and it was sheer bliss, even if I did get myself nabbed by the California Highway Patrol. The energetic Mr. Robert Mondavi let us shoot some pictures at his winery, where we'd had a terrific dinner a couple of nights before, and after that we motored over the Oakville Grade, where I rammed up and down the hills and hung the tail out all over the place for Ryan, who is apparently without fear. The car is so responsive and controllable that one is probably in danger of becoming wildly overconfident. The suspension and the Michelin tires simply take everything in stride, and no matter how vigorously you hurry the car you always have the nice feeling that all your options will remain open, should you ever come face to face with the Indescribable Awful. The car is an engineer's tour de force, and that's what you spend your 40 grand for. It is not a luxury car in the strictest sense of the word. The transmission in ours shifted hard. The seats are hard and manually adjusted. The outside mirrors are manually adjusted, just like the ones on lesser cars. Porsche, BMW and Mazda all offer terrific electrically adjusted mirrors on cars costing thousands less. Aside from detail differences on the instruments themselves, the instrument panel is that of any other contemporary Mercedes. The car defies you to justify its purchase on any grounds other than its performance. It is a four-door machine for going fast, nothing more. It has the most sophisticated mechanicals of any four-door sedan you can buy, but it won't treat you with the respect a man who spends $40,000 for a car deserves. The cloth upholstery Mercedes-Benz puts in them in Germany would help, but we had the uncomfortable feeling all the way across the country that we would have been more comfortable in a Rolls-Royce (for the same money) or even a Jaguar (for roughly half the price). This may be the car that Daimler-Benz has been working toward for 30 years, the culmination of all that pioneering experience with things like fuel injection, independent rear suspension, crashworthy structures, aerodynamics and -- last but not least -- racing. It is curiously appropriate that the people at Stuttgart-Untertürkheim should introduce this particular car at this particular time. The 6.9 is like an exclamation point on the story of an entire automotive era, perhaps the last great, fast sedan to be offered the public as we enter the puritan confines of the energy crunch. © July 1977 Car and Driver, USA.